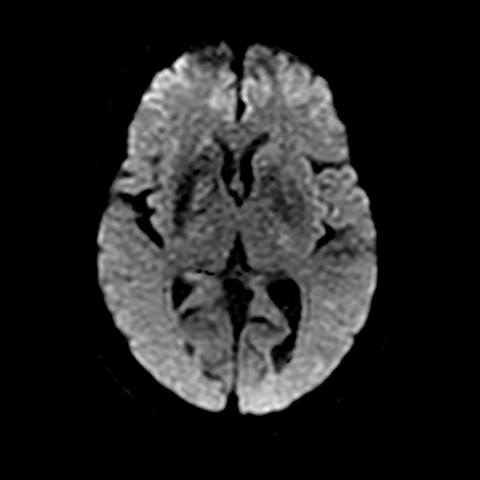 A 57-year-old woman presented to the emergency department complaining of headache, nausea and vomiting. Relevant medical history included hypertension and insulin dependent type 2 diabetes with poor to nonexistent medical compliance over the preceding year. Headaches were intermittent by patient report with accompanying vague reported coordination loss in the left upper extremity. Review of systems was positive for mild dysmetria in the left upper extremity. Blood glucose levels were elevated at 574 mg/dl, but secondary laboratory findings were negative for diabetic ketoacidosis. Blood pressure, glucose control and supportive care was initiated. The patient’s symptomatology normalized with supportive care and the subsequent short hospital course and discharge were uneventful. 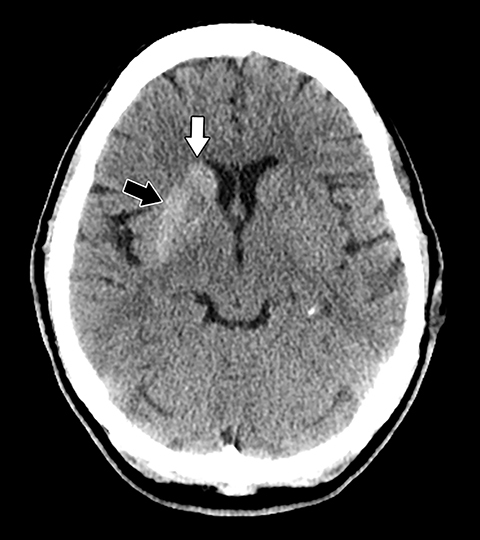 Noncontrast head CT obtained at admission was negative for focal hemorrhage or mass. However, the scan did demonstrate mildly increased density within the right basal ganglia, involving the caudate and lentiform nuclei and to a lesser extent globus pallidus (Figure 1). Subsequently, a cranial MRI scan was performed, demonstrating corresponding increased T1 signal and minimally decreased T2 signal within the right corpora striatum and globus pallidus. Contrast enhancement, diffusion restriction and mass effect were notably absent (Figures 2-5). The clinical history of poor glycemic control, dysmetria and coordination loss within the left upper extremity together with the characteristic imaging findings of contralateral basal ganglia hyperdensity on CT and hyperintensity on T1-weighted imaging are characteristic for the diagnosis of nonketotic hyperglycemia-induced hemichorea-hemiballism (NKHH). The unilaterality of involvement would be atypical for microcalcification, Wilson’s disease or excessive manganese deposition. Additionally, hemorrhage was excluded by the absence of supportive signal changes on MRI and the close conformation of the findings to the anatomic confines of the basal ganglia nuclei, sparing the surrounding internal and external capsules and devoid of mass effect. 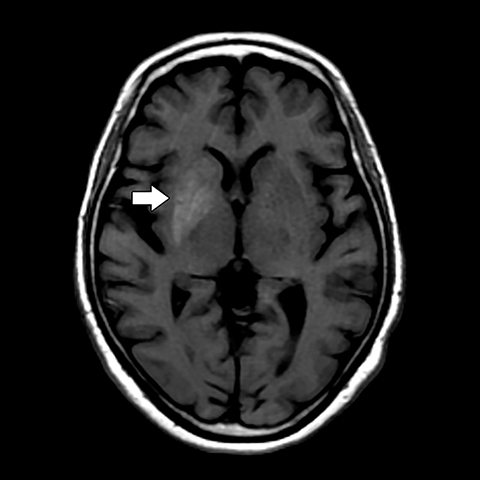 Though rare, the clinical syndrome of hemichorea-hemiballism in conjunction with hyperglycemia displays relatively characteristic imaging features typified by unilateral increased density within the putamen and, to a secondary extent, caudate nucleus and globus pallidus, accompanied by T1 shortening and hyperintensity on MR imaging. The clinical features vary in severity, typically waning rapidly with restoration of glucose control. Familiarity with the imaging features may allow the interpreting radiologist to first suggest the correct clinical diagnosis and expedite timely and appropriate patient care. Yu F, Steven A, Birnbaum L, et al. 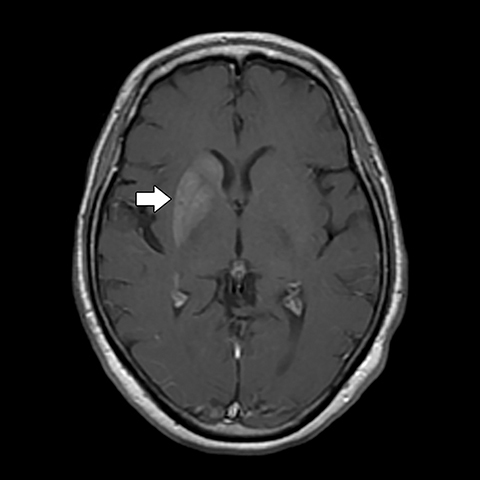 T2*-based MR imaging of hyperglycemia-induced hemichorea-hemiballism. J Neurorad. 2016; 44(1): 24-30. 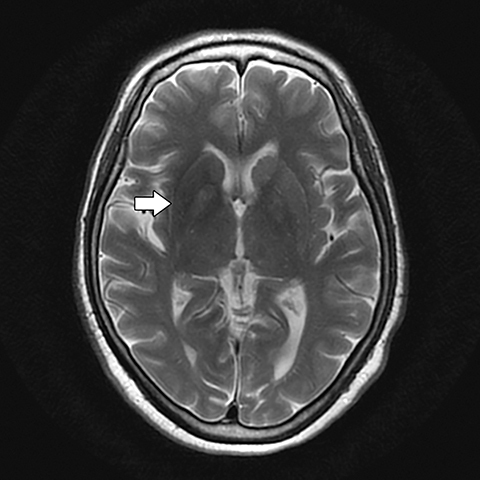 Cressman S, Rheinboldt M, Lin D, Blasé J. Nonketotic hyperglycemia-induced hemichorea-hemiballism. Appl Radiol. 2018;47(6):24-26. Prepared by Dr. Cressman, Dr. Rheinboldt, Dr. Lin, and Dr. Blasé while at the Department of Radiology, Emergency Radiology Division, Henry Ford Hospital, Detroit MI.